Palisada z segmentu Premium w każdym aspekcie spełniająca najbardziej wygórowane wymagania i dedykowana profesjonalnym obszarom zastosowań takim jak: firmy, instytucje, osiedla, obiekty handlowe, użyteczności publicznej. Konstrukcja spawana i sztywne wypełnienie z profili 25x25 mm zapewniają produktom takim jak ogrodzenia palisadowe niezwykłą wytrzymałość, stabilność i odporność na uszkodzenia. Z kolei zaawansowana i nowoczesna technologia antykorozyjna, zakładająca innowacyjny proces przygotowania powierzchni i nałożenie dwóch powłok, gwarantuje znakomitą ochronę przed działaniem czynników atmosferycznych i nadanie wysokich walorów estetycznych, podkreślających reprezentacyjny charakter ogrodzenia. Ogrodzenia palisadowe systemu METPOL bazują na dwóch wzorach przęseł o nowoczesnej i prostej formie estetycznej, harmonijnie komponującej się ze współczesnym stylem architektury przemysłowej i obiektów użyteczności publicznej. Cechą rozpoznawczą wyrobów takich jak ogrodzenia palisadowe wytwarzane przez firmę METPOL jest przede wszystkim zwarta, stabilna, masywna, trudna do sforsowania i bardzo wytrzymała konstrukcja, wykonana ze spawanych kształtowników stalowych, instalowanych do mocnych słupów, zapewniająca wysoki poziom bezpieczeństwa i kontroli dostępu. Ze względu na te walory techniczno-użytkowe, dużą odporność na działanie sił mechanicznych i ponadprzeciętną trwałość ogrodzenia palisadowe Prestige i Security szczególnie dobrze sprawdzają się na: obiektach przemysłowych, użyteczności publicznej, osiedlach mieszkaniowych, w placówkach oświatowych; poleca się je także jako eleganckie systemy ogrodzeniowe klasy Premium dla obiektów firmowych, o minimalistycznym, współczesnym dizajnie. Produkcja ogrodzeń palisadowych odbywa się w nowoczesnej fabryce METPOL przez doświadczoną kadrę techniczną, wyłącznie ze stali I gatunku (posiadającej odpowiednie świadectwa jakości) pochodzącej od renomowanych dostawców i przy zastosowaniu zaawansowanych technologii antykorozyjnych. Staranne ślusarsko-spawalnicze wykonanie, dbałość o szczegóły, wysoka jakość powłoki lakierniczej sprawiają, że oferowane przez nas ogrodzenia palisadowe nadają reprezentacyjny i prestiżowy wygląd grodzonym obiektom. 1000 mm 1600 mm 60x60 / 80x80 mm 4 pcs. 1200 mm 1800 mm 60x60 / 80x80 mm 4 pcs. 1500 mm 2100 mm 60x60 / 80x80 mm 4 pcs. 1750 mm 2400 mm 60x60 / 80x80 mm 4 pcs. 2000 mm 2600 mm 60x60 / 80x80 mm 4 pcs. 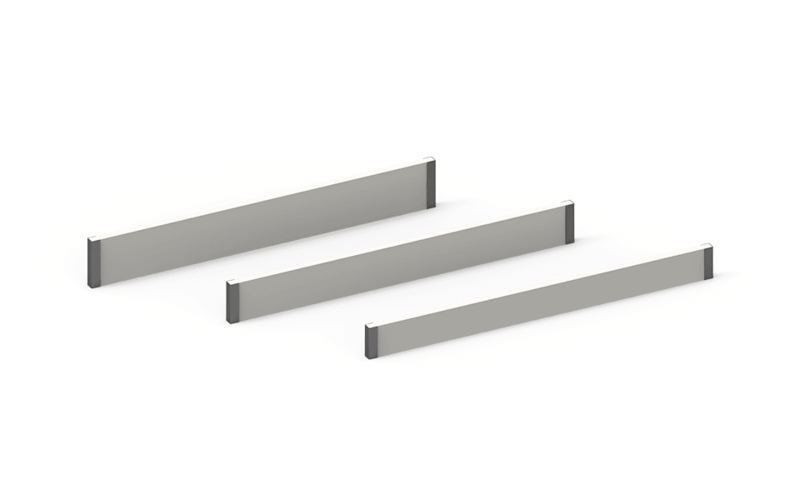 Posts in the standard version are intended for embedding in the ground in monolithic, point foundations. Holes in the ground with a diameter of 25-30 cm are filled with concrete of min. class B-15 to a depth corresponding to the local frost penetration zone. We also make posts terminated by steel feet on custom order, enabling fastening of posts to a socle or other hard substrate. Spans may be delivered along with the fastenings appropriate for masonry posts (e.g. clinker brick, cloven blocks, etc.). A fence with a foundation requires the application of longer posts than the standard provided for a fence without a foundation, for which lengths have been given in the table of dimensions. The recommended length of posts for a fence with a foundation is equal to the total aboveground height of the fence + 60-70 cm for founding of posts on a monolithic foundation in the ground. The prefabricated foundation mass-produced in standardized dimensions is replacing traditional solutions in the form of a costly socle poured out at the construction site more and more often. The success of ready foundations is dictated by such factors as: accessible price, easy assembly, high resistance to weather conditions and respectable aesthetic. The prefabricates we deliver come from renowned plants specializing in production of concrete elements and small architecture. Thanks to modern machine parks, reinforcement and vibro-pressing technology, the foundations we offer meet rigorous quality standards. 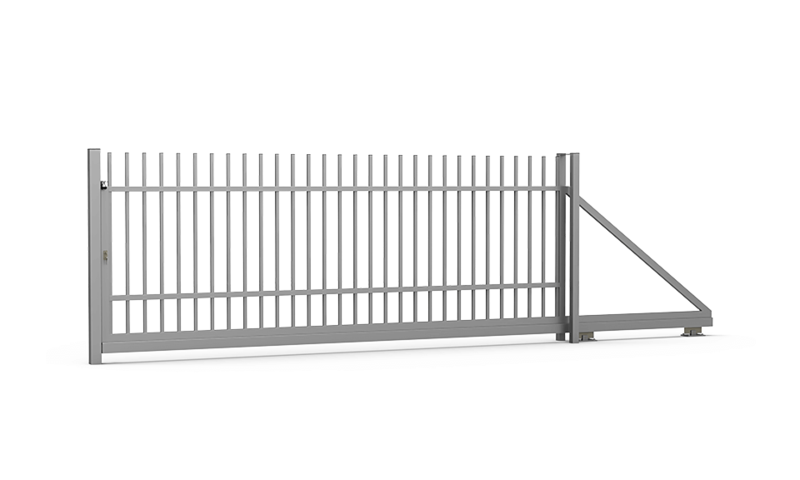 Leaf gates, sliding gates and wickets manufactured to the desired dimension and stylistically consistent with the fencing, with filling made using sections of the same dimensions and configuration as in fencing spans, are a natural supplement to our offer. A high quality prefabricated, reinforced foundation with a height of 20, 25, 30 cm, is an optional component of the system. The beautiful appearance is thanks to good industrial design and diligence in the production process. Our products do not require maintenance for many years and keep their visual appearance. The combination of galvanized and powder-lacquered coatings ensures high resistance to corrosion. Hot galvanization is the most effective and economical method of protecting steel against corrosion. Individual elements of the fencing in its raw form (made of black steel) are delivered to a specialized plant – galvanizing shop. Before they are galvanized, they pass through a series of operations related to proper surface preparation: abrasive jet processing, degreasing, etching and fluxing through immersion in vats containing specific chemical substances. Next, products are sent to a liquid zinc bath with a temperature of 440-460 ° C where the diffusion process takes place – steel and zinc form a common alloy layer onto which a layer of pure zinc is deposited (during extraction of parts from the bath). This method of coating ensures thorough coverage of the product’s entire interior and exterior surface, including hard-to-reach places. The hot-dip zinc coating protects the steel against corrosion for many years. Assuming minimum mean thicknesses of obtained coatings within the range of 55-70 um (microns), we obtain anti-corrosion protection for a very long period of time, not requiring systematic maintenance, freeing the user from further, significant operational costs. The combination of galvanized and powder-lacquered coatings – the DUPLEX system – ensures high resistance to corrosion. 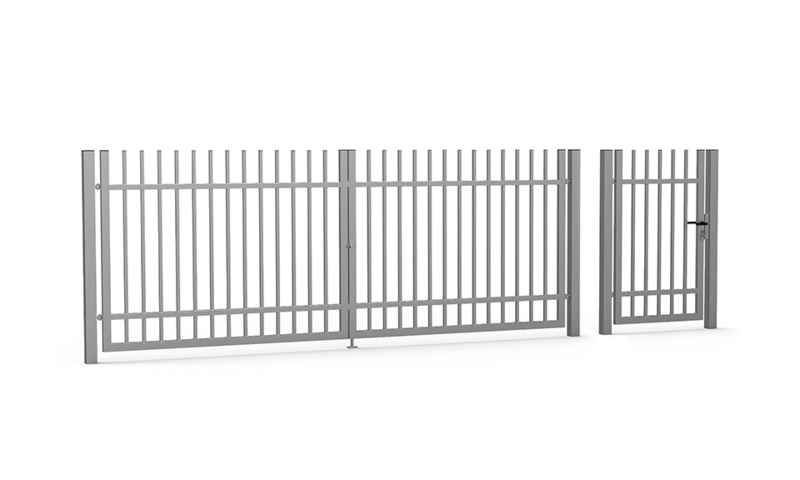 Fences, gates and wickets – previously galvanized – are powder-painted using the electrostatic method using standard colors or any color from the RAL palette, according to the Customer’s individual needs. This process – with a rich palette of over 200 colors at our disposal – makes it possible to achieve the desired coloristic effect and aptly adapt the appearance of fencing to the environment and to the nature of the building being fenced off. Moreover, the combination of galvanization, surface preparation (in this case, Oxsilan®) and powder-lacquering technology – which professionals call the DUPLEX system – significantly increases the level of protection of steel products against corrosion, protecting the galvanized coating against natural oxidation of zinc as a result of weather factors. In turn, the application of high-quality powder paints at METPOL’s paint shop – meeting the requirements defined in the European QUALICOAT standard – as well as their very efficient and precise application by an automated unit of lacquering sprayers, translate to coatings with excellent functional and aesthetic properties. The modern powder paint shop, with a properly designed surface preparation process, guarantees the highest quality. Application of the lacquer coat takes place in METPOL’s modern, automated paint shop, where special emphasis is placed on the proper mechanical and chemical preparation of parts’ surfaces, which has a decisive impact on the durability and adhesion of the lacquer. For this purpose, METPOL introduced the innovative Oxsilan® technology – used at Mercedes Benz production plants, among others – in 2012. Oxsilan® technology not only ensures very high anti-corrosion resistance but also involves the use of chemicals friendly to the natural environment (consistently with the values METPOL holds dear). In the first stage, products pass through mechanical processing, then they are transported into the surface preparation tunnel for: degreasing washing, rinsing and silane application. Parts that have been cleaned and dried thoroughly reach the lacquering cabin, where automatic manipulators coat them with powder paint using the electrostatic method, with a min. thickness of 100 um. The final stage is holding products in a furnace at a temperature of 160 – 200 ° C (polymerization). Zamieszczone w serwisie treści - zdjęcia, wizualizacje, teksty - stanowią przedmiot ochrony w rozumieniu prawa autorskiego oraz prawa własności przemysłowej. Zabrania się ich kopiowania i wykorzystywania w celu prowadzenia jakiejkolwiek działalności komercyjnej. Więcej informacji na ten temat podano w Regulaminie serwisu.